High risk doesn't always mean high rewards. Consider buying shares of these three intriguing businesses instead. The allure of buying so-called "penny stocks" is understandable. After all, who wouldn't want to buy a piece of a tiny, seemingly promising business for fractions of a dollar and watch that business hit it big? But even putting aside the fact that a company's stock price when taken alone is essentially meaningless, we're still left with the quandary that the businesses underlying penny stocks are usually terribly risky and -- all too often -- result in massive losses to shareholders. Steve Symington (2U): Given their speculative nature and propensity for massive losses, I could never in good conscience call penny stocks a good "investment." Meanwhile, arguably the best investment anyone can make is in one's own education. So if you don't mind some volatility along the way, consider buying shares of online education platform leader 2U, a promising business that's effectively disrupting the world of higher education as we know it. As it stands, 2U has partnered with more than 30 leading universities -- including Baylor, Harvard, Fordham, Pepperdine, Berkeley, and Yale, to name only a few -- to bring 64 new online graduate programs to life. But over the long term, 2U expects to grow that number to around 250 programs in the U.S. alone. That's not to mention the prospect for international graduate programs, or -- thanks to its acquisition of short-course program leader GetSmarter last year -- the promise of incremental growth through non-degree alternative programs. That's not to say the market hasn't recognized 2U's potential. Only a few months ago, shares had more than tripled since the start of 2017 as the company consistently crushed expectations each quarter, repeatedly accelerating its program launch cadence because of university demand and raising its forward outlook. 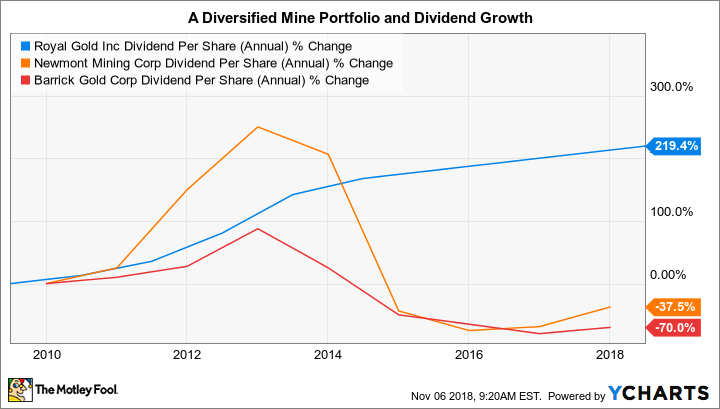 Reuben Gregg Brewer (Royal Gold, Inc.): One of the frequent finds in penny-stock land is tiny gold miners, often backed by just a single mine or nothing more than the hope of building a mine. That's a high-risk gamble unless you have extensive knowledge of the precious-metals market and the assets in which you are investing. Far too often, a great mine turns out to be a dud. That's why investors should consider gold and silver streaming company Royal Gold. This company provides cash to miners in exchange for the right to buy gold and silver at reduced rates in the future. Miners often use the cash to build new mines or expand existing ones. Royal Gold, meanwhile, contractually locks in low prices, and thus generally wide EBITDA margins, in good markets and bad. The big benefit for investors, however, is that it doesn't just have one streaming deal -- it has nearly 200. Royal Gold's portfolio contains 192 investments in total. That currently includes streaming and royalty deals covering 39 operating mines and 22 that are in more advanced stages of development. The rest of its investments are in earlier-stage mines. The mines that are producing allow Royal Gold to pay a consistent dividend (the dividend has grown every year for more than a decade) and invest in future streaming deals. All of the development and pre-development mines, meanwhile, provide exposure to the upside potential of the types of projects that often entice investors into penny stocks. Only this diversified portfolio is being curated by a company filled with experts. Leo Sun (Snap): Snapchat maker Snap trades about 60% below its IPO price, because of its decelerating growth, lack of profitability, and relentless competition from Facebook's (NASDAQ:FB) Instagram. Snapchat's daily active users (DAUs) fell 1% sequentially to 186 million last quarter, marking its second sequential decline in DAUs and indicating that its growth had peaked. However, Snap's average revenue per user (ARPU) still rose 14% sequentially to $1.60, thanks to a shift to programmatic ads, and its net loss narrowed slightly, both annually and sequentially, to $325 million. Its negative free cash flow of $159 million also marked a slight improvement from negative-$220 million a year earlier. Snap's remaining bulls argue that Snapchat remains the most popular social-networking platform among U.S. teens, and that the company can continue growing its ARPU with new initiatives such as Snap Originals, Snappable AR games, and a visual shopping partnership with Amazon.com. The bulls also believe that Snap could still be acquired by a bigger tech company or taken private. The bears argue that Snap is running out of money and talent, with its cash and equivalents sliding 11% sequentially to $350 million last quarter and a number of key executives departing. They also argue that Snap's valuation, at 7 times this year's sales, makes it an unattractive takeover target. I wouldn't touch Snap at these levels, but I also don't think it's doomed yet. It's basically a coin flip, but it's arguably better than buying a penny stock. Penny stocks are a great way to predictably lose money. But if you really want to make your money work for you -- whether we're talking about 2U's changing the landscape for higher education, Royal Gold's legitimate operations, or the possibility that Snap's best days still lie ahead, we think you'll be much better off buying shares of these three businesses instead.